The longest journey, is the one from your head to your heart. Beautiful, is it not? I heard this in one of those Discovery documentaries and I promised myself to put it in the blog. The journey to shift ourselves from depending too much on our logic to your feeling. The journey to learn how to walk the path of life using our intuition and conscience. The journey to learn how to use not only our physical eyes, but also the eyes of the soul. And I agree, it is a long journey indeed. I mean, how many of us are brave enough to trust our instinct and live life without thinking too much? Will we ever dare? When was it exactly when we start losing our courage to dream and to be spontaneous, because of all the ‘pragmatic’ and ‘realistic’ thoughts we have? We say we have grown up. Perhaps we are going in the wrong direction. It’s that way, not this. The next time we see a child cry, let’s not think of how he/she has distracted us, feel the sadness and the need for love. The next time we see the rain falls, let’s not think of our way home, feel, enjoy. The next time we sip our morning coffee, let’s not think about our day schedule, feel the warmth of the coffee. Start walking that longest journey. Perhaps we would then realize, it is not as far as we initially thought it would be. This entry was posted in quote on January 31, 2007 by Eva. I cannot believe I have forgotten to write this. During the last muslim’s festive season, my family did our traditional sungkeman – where we kneel down before our elders and ask for forgiveness and blessings. During my sungkem to my mom, my mom whispered and thank me for my kindness. Thank me for my kindness? Honestly mom. If only you realize the magnitude of love and kindness you have poured to me throughout my life. Obviously she does not realize that. Typical mom. Love her. Belated happy birthday, mom. Thank YOU for your, um, everything. 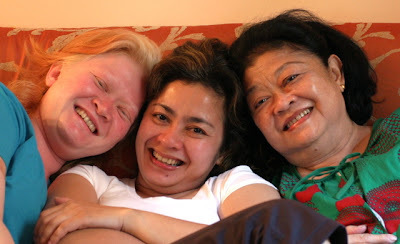 Pic: me, sis and mom. Straight from the bed. Sis and mom – the two mother figures in my life. I could not ask for a better role model. I wish I can be half as good as they are. PS: Happy birthday to you too, Ndien. We did not nickname her princess (TP-Tuan Putri) for nothing. This entry was posted in family on January 19, 2007 by Eva. I love yoga. Many friends can tell you that. And I have a chicken stuffed animal that have been with me since I don’t know when and often speaks on my behalf. Many friends can tell you as well. And I love books. Almost any kind of books. Many friends can tell you that too. So what did a friend of mine do? 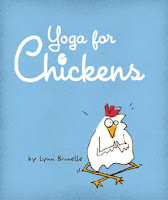 She gave me a book titled Yoga for chicken. There was not any particular reason – it was not even my birthday and she was not even returning from a trip. She said she saw the book and straighforwardly thought of me. So she just bought the book as a gift for me. Such a simple gesture from a dear friend that shows she really knows me. Love the gift to bits. And it was a hilarious book too. This thread is dedicated to you Ri. Wherever you are right now. Whatever you are doing. No particular reason. I have just returned from my yoga class and saw Chicken and I thought of you. Such a sweet character. I cannot think of one single person who does not like you. This entry was posted in friend on January 19, 2007 by Eva. Have you been following the news on avian flu? I have. Well, how can I not if they are always on the headlines and on the radio or tv? The endemic has gotten to a stage where we need to kill thousands of chickens, ducks, and pigeons for the sake of humanity. Killing thousands of being in the name of humanity. That does not sound right, does it? I am not against the move. Perhaps it is something we ‘need’ to do. My friend’s father is a bird lover. I can’t imagine him killing his birds. Must be hard. Even harder for those who make a living out of it. Granted, it is something we need to do. The question is how did we get to this stage? We have killed our forests. Now we are killing the animals. How can nature not strike back? Perhaps its something THEY need to do as well. An eye for an eye. This entry was posted in macro on January 17, 2007 by Eva. Just when we thought it was safe..
A couple of days ago I saw a photo article of people choosing to use trains because they thought it was safer – in light of the recent ship and aircraft accidents. This morning I saw an article of train derailed and fell from the bridge. This entry was posted in macro on January 16, 2007 by Eva. My sister has just returned from her high school reunion. They also invited the teachers. 200+ students attended, 34 teachers came. They sent a chartered upper-class taxi to pick up each and individual teacher. They provided donation to the teachers (you know how poor the welfare of school teacher is in Indonesia). They greeted the teacher as if they were heroes. They are. Students and teachers blended in. They ate, laughed, sang, dance and talked about old times. I cannot imagine how happy that time must have been – especially for the teachers – the often forgotten heroes of our lives. My sister’s Class of 82 is truly amazing. They gathered together every two months – for a quran study, a bible study, a social gathering, do some sports or even go out of town together. They collect money – 40% to fund their activities and the other 60% for social cause. The social cause is either to provide scholarship for some of the current students in their high school or to provide scholarship for the children of their class mates who are not so fortunate financially. Some also volunteered to teach in the high school. If only each of our small community gather together and do what we can to help those who are linked to our community, those in our immediate surrounding. It does not really take much. I am just talking here. They are already doing. I am nothing compared to them. Hats off. This entry was posted in friend on January 14, 2007 by Eva. This article was taken and summarized from today’s Kompas East Java edition. East Java’s unemployment rate, which was expected to lower in 2007, is actually growing high. According to the latest data released by the East Java’s Provincial Office of Manpower, the increase is about 38% compared to last year’s rate of unemployment. Lapindo Brantas Inc’s mud flood may be attributed as one main factor that triggered such rise. The unemployed are largely low educated people (primary and high school graduates) and around 3,000 of them are victims of work termination due to operation shutdown of manufacturing companies affected by the Sidoarjo mud flood. This entry was posted in macro on January 10, 2007 by Eva.